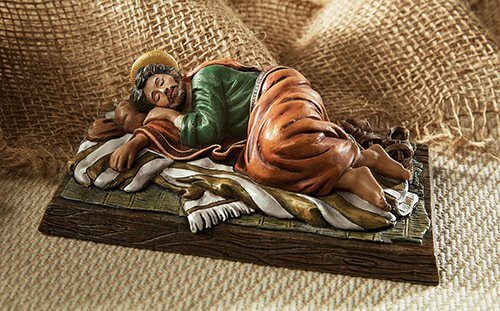 Place your cares and prayers under Sleeping Saint Joseph! A man of silence and strength, the humble Saint Joseph sleeps peacefully as the work of God takes place. The Gospel of Matthew reminds us of Our Lord's voice whispering to Joseph while he rested in the night. Place your prayer requests under the statue and call upon the intercessory prayers of the foster father of Jesus. A favorite devotional of Pope Francis, this tradition reminds us to unite with Saint Joseph as he lifts up our petitions to God.